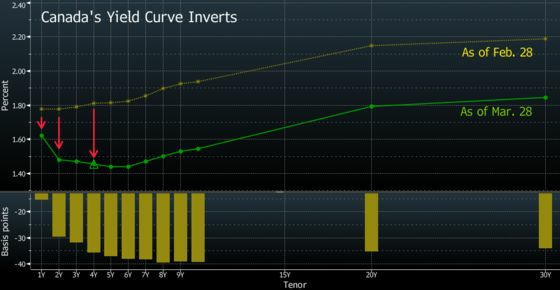 (Bloomberg) -- Canada’s inverted yield curve may be flashing recession signs, but it hasn’t prevented investors from enjoying some of the best quarterly returns in years. The plunging bond yields boosted gains on government and corporate debt, with an aggregate index of Canadian bonds in U.S. dollars returning 5.4 percent in the first quarter, compared with a 3 percent increase for a comparable U.S. gauge, according to Bloomberg Barclays indexes. That was the biggest quarterly gain in three years for the Canadian index. The Canadian dollar also rallied, making the loonie the best performing currency among developed nations this year, with a 2 percent gain. Even stocks soared amid the recession fears - the main equity gauge had its best quarter in almost a decade, up 13 percent. Investors are lapping up Canadian assets even after the yield curve inverted. This shift, when longer-term interest rates dip below short-term yields, often signals that a recession looms and that policy makers will be forced to lower borrowing costs. Canada’s economy is clearly slowing though growth for January -- at an annualized rate of 1.6 percent -- was better than economists expected. The numbers released Friday by Statistics Canada paint a much less bleak picture for an economy that came to a near halt at the end of last year. Bank of Montreal nudged its forecast higher for first-quarter growth on the back of the report, to 0.5 percent. The drop in yields have been sparked by expectations the Bank of Canada will pause its tightening cycle after five interest rate increases. If there is any move in rates this year, it’s more likely to be a cut, based on trading in the swaps market. Chances of a rate cut at the Bank of Canada meeting in September have risen to about 37 percent, from 20 percent earlier in March, according to swaps rates. Traders assign a zero percent chance of a hike by then. “I would put the root cause of the outperformance of Canadian credit basically on the posture of the Bank of Canada -- there’s a risk that it can actually cut rates now so we’ve seen the yield curve come down," said Philip Petursson, the chief investment strategist at Toronto-based Manulife Investments. Over the course of this year, Petursson expects that trimming equity holdings and shifting into fixed income will make sense. “At the very least, you’re clipping a coupon that is much more attractive today than where we were a year ago," he said. Petursson sees the Canadian stock benchmark trading in line with the S&P 500 and international equities, estimating returns in the mid-single digits over the next 12 months as a result of more modest earnings growth. For fixed income, he expects a similar return profile of mid-single digits, assuming interest rates fall. “Investment grade corporate debt as well as high yield is attractive relative to equities over the next six to 12 months,” he said. “As we look further into 2020, sovereign debt may hold a certain appeal." 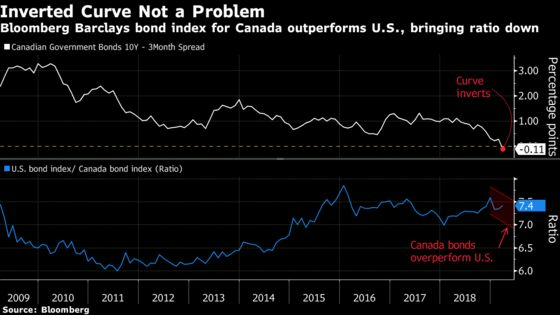 Franklin’s Briggs expects returns for the Canadian bond market of about 2 percent to 4 percent if the curve inversion is just signaling a slow patch ahead. "If it’s something worse, such as a sharp slowdown or a recession, my guesstimate is that we could see rates move lower and returns in bonds go higher by anywhere from 3 to 6 percent," he said. Yields move in the opposite direction to bond prices, so lower yields boost returns. Meanwhile, Canada’s energy sector is finally getting some love. Big oil and pipeline companies are the biggest gainers in the Canadian bond market this year, with the top performer Canadian Natural Resources Ltd. rising three times more than other companies as higher oil prices bolster earnings prospects. “Canadian oil companies are strong and they’re very disciplined," Briggs said. "They’re like the rest of us, waiting for some policy certainty, but they’re in the best seat to capitalize on all of this. It’s a waiting game and they can afford to be patient."